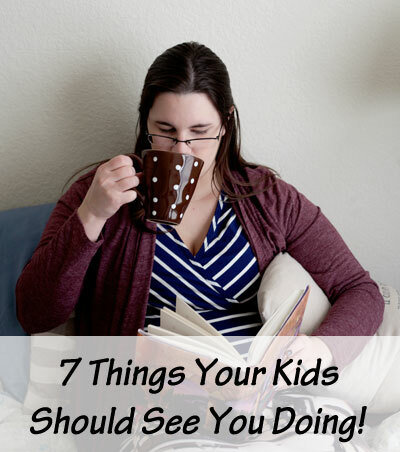 Seven things your kids should see you doing — so they know you’re human! I see posts sometimes of all the super-important things you must do everyday, and morning routines you should implement, and evening routines, and cleaning habits…and then there are things you have to not only DO but also make sure your kids SEE you do, and I mean I don’t even click on these things so I don’t know for sure, but based on the pictures I’m pretty sure they involve sewing homemade clothes and baking extravagant meals from scratch, and having an hour long quiet time that begins at 5am, and keeping every nook and cranny of your house sparkling clean, and hitting the gym every day, and wearing meticulously styled outfits that are never covered in spit-up or snot or peanut butter…and, of course, ALL THE THINGS! 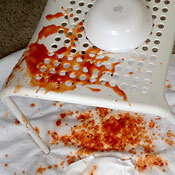 Just one little problem…there’s not a chance I could manage to be a perfect suzy homemaker, super-mom for one day, much less non-stop. 2. Drinking Coffee – Bonus points for this one if I can get one of my kids to actually prepare the coffee for me while I’m still in bed, that way there’s no question in their mind about what I’m drinking. 3. Eating Chocolate – I keep a bag of Hershey’s in my desk drawer at all times to help me meet this goal. 4. Ordering Pizza – This one is crucial…what kind of human actually makes dinner every.single.day? Not one that I’d believe is real, that’s for sure! 5. Vegging in front of the TV – Granted, this mostly takes place after the kids are in bed, but sometimes I make it a point to put on an episode of Gilmore Girls or Psych in the middle of the day and just chill…probably with my baby and toddler both in my lap, cause it’s not like moms get to actually relax alone when kids are awake, but I do my best to be unproductive and lazy for a good chunk of time. 6. Procrastinating – I do this several times a week by waiting until the last possible minute to scramble and try to get the house decent before my husband gets home and sees how ridiculously messy it got during the day. Apparently I need to veg in front of the TV more often. And believe it or not, that IS on my birthday bucket list of things to do this year. This is so good. I love it…and I love that you are a Gilmore Girls fan too!! Hahah!! This is a list I can get behind! No problem!